YTO is an experienced mobile power station manufacturer in China. Manufactured in accordance with ISO9001:2008 and ISO14001 standards, our mobile power station is high quality, environmentally friendly and reliable in performance. Our DZ80G, DZ100G mobile power station is fitted with modified YTO crawler tractor chassis, so it is reliable in performance and cost effective. Furthermore, it is equipped with high quality electric welding machine, air compression machine, medium frequency heater, power generating system, etc. The construction machinery is able to meet the complex operational requirements of the field environment. The overall dimension of our DZ80G, DZ100G mobile power station is 5100×2370×2960mm. Ground pressure is 33.9 KPa. Maximum lifting moment is 6.6 T•m. Maximum rotation angle is 360°. Our DZY80 and DZY100 mobile power stations use high quality hydraulic components, Cummins engines, and hydraulic telescopic cranes. The construction equipment can be equipped with air compressor, electric welding machine, and some other devices. Characterized by powerful traction, good braking performance, easy operation, and easy maintenance, it is applicable to the long distance pipeline construction in various working conditions. The rated voltage of our DZY80, DZY100 mobile power station is 380/220V. The rated Frequency is 50 Hz. Maximum mass is about 11500kg. Maximum traction is 91 kN. 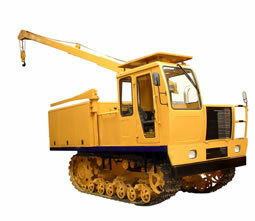 We are engaged in the production and sale of construction machinery and agricultural machinery and some other vehicles. With more than 50 years of experience, we know well how to produce high quality products at low price. Now, our mobile power station, combine harvester, pickup truck, road roller and other products are well received by our customers in Asia, Africa, America, Europe, and more. Please feel free to contact us if you have any problem. We sincerely hope that we can serve you.